After 50 Years, An Olympic Medal Dispute Is Resolved : The Two-Way The International Olympic Committee recognized that American figure skaters Vivian and Ronald Joseph, who originally finished fourth, won the bronze at the 1964 Winter Games in Innsbruck, Austria. 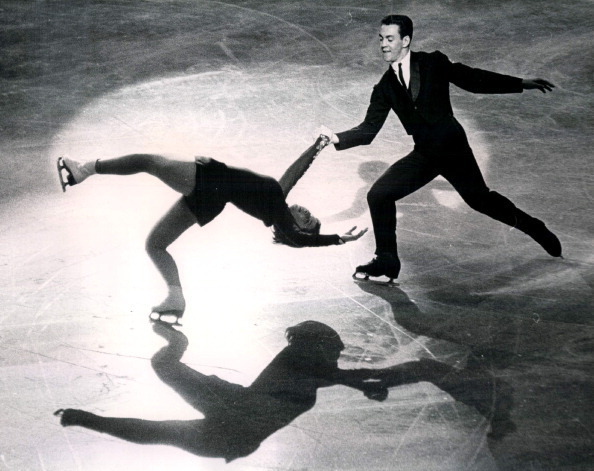 American sibling skaters Ronald and Vivian Joseph perform the "death spiral" on Oct. 26, 1963, at the World Championships. The International Olympic Committee announced this week that the Josephs, who originally placed fourth in the 1964 Winter Games in Innsbruck, Austria, were in fact the bronze medalists. American figure skaters Vivian and Ronald Joseph placed fourth in the 1964 Winter Games in Innsbruck, Austria. But a couple of years later, the International Olympic Committee determined that the West German silver medalists, Marika Kilius and Hans-Jurgen Baumler, had signed a professional contract before the games and stripped them of their medals (the IOC took such things seriously in those days). The American siblings were given the bronze at a ceremony in Chicago, The New York Times reports. And the bronze medalists, Canadians Debbi Wilkes and Guy Revell, were awarded the silver. Decades later, Vivian Joseph was at a party in Chicago at which she was introduced to a guest as a bronze medalist at the 1964 games. But that guest looked her up online and disputed the claim. "I wasn't very happy," she told The Times last year. "I mean, how embarrassing. The guy looked it up and said I didn't win a bronze medal. It was one of the most bizarre things I've ever heard of." Turns out, the IOC had "rehabilitated" Kilius and Baumler, the West Germans, in 1987 and re-awarded them their silver medals. It never explained what that would mean to the other medalists. The Times reports that the IOC has finally confirmed that the Soviet team, Liudmila Belousova and Oleg Protopopov, remained the gold medalists; the Canadians and the Germans took silver, while the Josephs got the bronze. The IOC told the newspaper that that result was intended to be official since 1987, and it has since updated its website with the new results. "An Olympic medal is the ultimate sports symbol of hard work, sacrifice and the perseverance of athletes, parents and coaches," Vivian and Ronald Joseph said in a statement. "We are happy the issue of our medal has finally been resolved."